Joseph: "Basically, we were looking to get a new front door put on, our other door was having issues, so I went to the common sites like Home Advisor and Angie's List and I just started pulling up companies that had a high rating of 5 and above, and Pinnacle showed up on one of them. I placed a call out to all those companies that were rated high, and Pinnacle was one of the first to respond back, so I had em' come in and give me an estimate. We evaluated the product as well as the company, and Pinnacle seemed to offer the superior door, and quite honestly the price was right, so that was one of our deciding factors, the quality and the price." Joseph: "They replaced our exterior front door; we had a steel door with two side lights and we replaced it with a fiberglass door with two sidelights. We also got decorative glass put in the side lights and the door. It really has enhanced out hallway... brought in a lot more light, which is what we were looking for. It was very easy, Pinnacle was actually one of the companies that had some of the best communication with us as we were going through the project. The sales person was constantly in touch with us, scheduled a couple visits with us to discuss the door and some other things that we might want to look at as far as the door was concerned, so the communications was always there, they were always in touch with us as we were going through this project." Patricia: "I think we even spoke to James, and some of the questions we had; he was very good about getting back to me and answering all my questions, especially when it concerned time lines and all. I was here the day that they installed the door. It was very well installed, I think the guys did a very good job. They cleaned up everything, every mess they made, and they were very meticulous in how they installed the door and I could tell as I was watching them throughout the process." Joseph: "One thing I'd like to say about the installation is, is that we had one of the, I guess his name was John, came out and he came out to do the final measurements for the door, and he actually gave us some good advice. We were struggling with the color of the door, and he gave us some good advice as to assist us in picking the color, and it ended up being spot on because we were trying to match it up with our hardwood floors, and the color came out spot on." Patricia: "We started with the wood look for the vinyl door, and we started with I believe a darker grain. As we were discussing this with John he kind of let us know that we might not want to go down that road because of the color of the hardwood that would be in front of the door, so we thought twice about it and luckily he was right. It looks really good." Joseph: "Our expectation was that we wanted to one, deal with a quality company that we didn't want to have to go through the high pressure sales. Some of the companies we dealt with, that turned out to be the case. With Pinnacle, Ron came in, helped us go through the process of picking out the door, showed us all our alternatives, provided us with a lot of samples, a lot of discussion of things to think about, and gave his opinion on some of the selections we were making, and it all turned out great. Definitely going to be replacing the roof here soon, not right away, but probably within the next couple years, and we'll definitely consider Pinnacle for that job, as well as the siding too, because the house is 15 some years old, the siding is fading, and some of the examples of the siding that he showed us that Pinnacle dealt with was pretty interesting stuff, a lot of roofing was some high tech stuff, and he definitely peaked our interest to go back to Pinnacle and look at those jobs. Most of our family is our of state, but anytime anybody asks us about the door, which we get questioned quite a bit about it, we bring up the fact that we had Pinnacle install it, and how happy we were with them." Patricia: "We get a lot of compliments on the door, with our friends that come and our neighbors that see it, and we tell them it was Pinnacle Exteriors. If you're interested in a door that's the first place I would go, because we did our homework and that's where we ended up going." Joseph: "Yeah, and that's one thing our neighbors know us for, doing our research (both laughing). 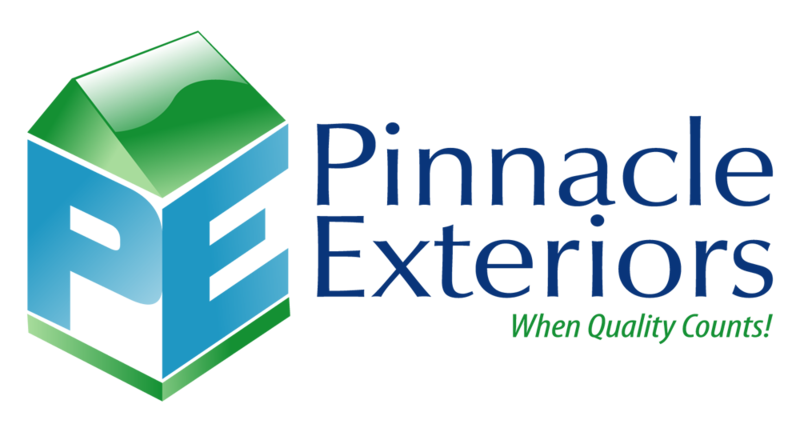 Other than the fact that we're really happy with it, we're really happy with the buying experience, going through the installation, dealing with Pinnacle overall was a pretty pleasing experience for us." "... I placed a call out to all those companies that were rated high, and Pinnacle was one of the first to respond back, so I had em' come in and give me an estimate. We evaluated the product as well as the company, and Pinnacle se emed to offer the superior door, and quite honestly the price was right, so that was one of our deciding factors, the quality and the price." Joseph: "Our expectation was that we wanted to one, deal with a quality company that we didn't want to have to go through the high pressure sales. Some of the companies we dealt with, that turned out to be the case. With Pinnacle, Ron came in, helped us go through the process of picking out the door, showed us all our alternatives, provided us with a lot of samples, a lot of discussion of things to think about, and gave his opinion on some of the selections we were making, and it all turned out great." Patricia: "... I was here the day that they installed the door. It was very well installed, I think the guys did a very good job. They cleaned up everything, every mess they made, and they were very meticulous in how they installed the door and I could tell as I was watching them throughout the process." Patricia: "They cleaned up everything, every mess they made, and they were very meticulous in how they installed the door and I could tell as I was watching them throughout the process." "They replaced our exterior front door; we had a steel door with two side lights and we replaced it with a fiberglass door with two sidelights. We also got decorative glass put in the side lights and the door. It really has enhanced out hallway... brought in a lot more light, which is what we were looking for." Joseph: "We evaluated the product as well as the company, and Pinnacle seemed to offer the superior door, and quite honestly the price was right, so that was one of our deciding factors, the quality and the price."